If you own a boat you know how important it is to protect your investment from wet, wind, weather, and the occasional bird dropping. When buying a boat cover you need to consider the fabric, the fit, and the support. Not all fabrics are equal. There are four main factors that affect how durable, waterproof, breathable and stable the boat cover fabric is. The following factors affect your choice of selection. Acrylic is a high end material, usually only in heavier weight fabrics (9 0z. plus). Polyester is often a mid to top range fabric, typically followed up with a three or five year warranty depending on the fabric weight. The industry standard for a marine fabric is the venerable Sunbrella marine fabric, with the Pacific Blue being the single most popular color in marinas everywhere. All boat cover manufacturers offer either Sunbrella or Sunbrella equivalent fabrics. Fabric weight is measured in ounces per square yard. The weight of the fabric is often (but not always) telling of both the warranty and lifespan. Heavier fabrics are in the 9 oz. range, lightweight fabrics are in the 6.5 oz. range. How tightly woven the fabric is will indicate durability – a tighter fabric will last longer. How big the weaving threads (thread count) are will also indicate durability – the smaller the threads for a given weight will produce a more durable fabric. A 9 oz. tight weave fabric will last longer than a 13 oz. course weave fabric. Of interest here; Marine or Pacific Blue (a middle blue) seems the most stable color. Reds and Yellows fade faster and wear out sooner than other colors. Compare top fabrics and see which one fits your needs. The better the fit the better your boat cover will function for you long term. Trailerable boat covers often come with a tighter fit and straps to keep the cover snug while trailering. However, if you are just looking for a cover to keep your boat dry and aren’t planning on trailering it any time soon, Taylor Made Products makes a line of economy covers that may fit with your budget. Westland, TaylorMade Products, and ShoreMaster all make trailerable boat covers. These covers are either custom made to your boat’s make and model or come in a less-snug, semi-custom boat cover version that is less expensive. Westland’s custom boat covers come with 1/4″ draw rope in the hem for a snug fit as well as 12 straps with buckles for securing the cover. Taylor Made Products custom boat covers are secured with tie down straps made from 1″ wide heavy duty webbing, plus a nylon rope in the boat cover hem with patented rope lock for cinching the cover tight. You don’t want your boat to look like this. 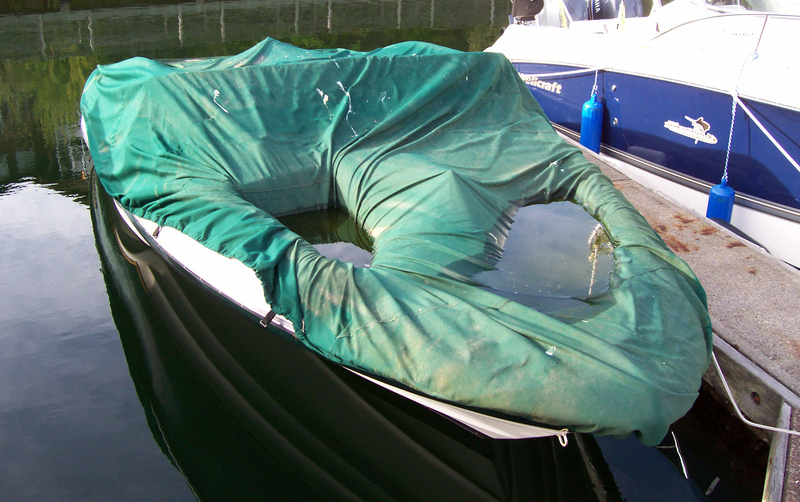 Supporting your boat cover when storing your boat for longer periods will help prolong the life of your boat cover and ultimately the life of your boat. Get a pole. The single cheapest way to prop up the cover and prevent water pooling while also offering ventilation is with a vented pole assembly. They are incredibly easy to install in any cover, in virtually any location. Get a strap system. This is useful for the large cockpit expanse on most boats and will prevent the huge, tearing puddle that can happen. There are mounts at four corners connecting at the center with a pad on pole arrangement. Get some Bows. It is hard to beat a system of Boat Cover Bows with their matching Sockets for keeping the cover arched. This is the most foolproof way to keep the boat dry and it gives you a fighting chance against snow.